May corn futures closed down 1.5 cents per bushel week-on-week, finishing at $3.61 on Friday afternoon. Corn prices remain suppressed, so the question is: Are there any catalysts on the horizon? Let’s review the latest corn market news and price analysis. 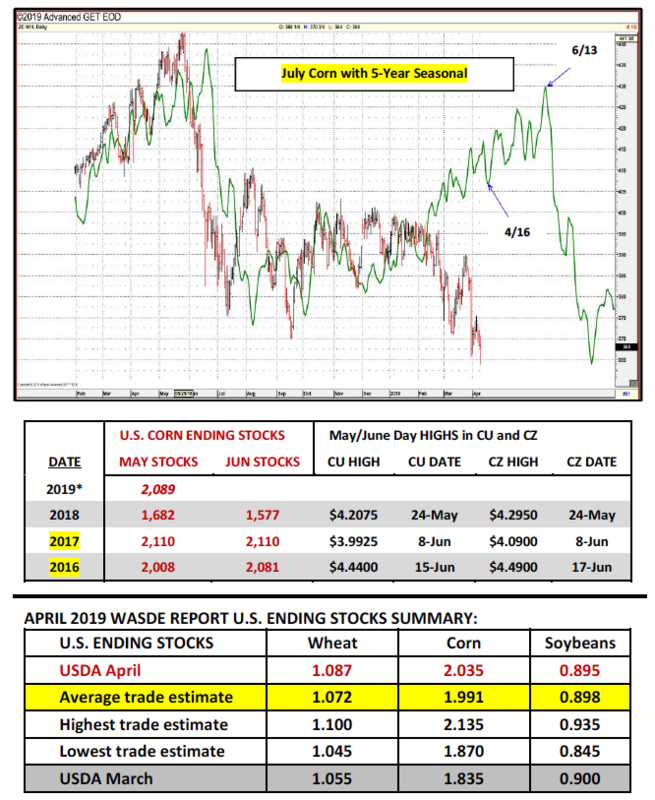 On Tuesday the USDA released its April 2019 WASDE report, which incorporated some key demand revisions based on the USDA’s recently published March 1 Grain Stocks estimates. In corn, traders were bracing for a potential significant increase to 2018/19 U.S. corn ending stocks with March 1 corn stocks coming in 270 million bushels above than the average trade on March 29th. The USDA did not disappoint raising 2019/20 U.S. corn ending stocks 200 million bushels in the April WASDE to 2.035 billion bushels. All three demand sectors saw downward revisions with Feed & Residual Use lowered 75 million bushels to 5.300 billion, Corn-Ethanol Demand down 50 million bushels to 5.500 billion, and Exports down 75 million bushels to 2.300 billion. The USDA’s revised carryout projection was slightly higher than the average trade guess of 1.991 billion bushels. With 2018/19 U.S. corn ending stocks proving higher than the average trade guess, why did corn rally off of the day lows on Tuesday following the report’s release? 1) Although the average trade guess for ending stocks was under 2.0 billion bushels, several prominent private analysts were stoking fears of a figure well above that level. Therefore I’m of the opinion the market was pricing in a number closer to 2.1 billion bushels, which partially explains why May corn futures made a new contract low of $3.55 ¼ shortly before the report came out only to then rally. 2) If you are a Corn bear what’s the next fundamental news story that’s going to push corn to new contracts lows when the 5-year price seasonal suggests corn should do just the opposite, working higher now through early June? I don’t have an answer for that. Those are reasonable questions. In fact, Crop Scout Michael Cordonnier in his weekly report on Monday did not waver from prior comments suggesting he still believes U.S. corn acreage will NOT increase more than 1 to 2 million acres this spring (90 to 91 million acres versus the USDA’s March estimate of 92.8 million acres). With cold and wet weather still expected to wreak havoc on the WCB over the next 6 to 10 days and flooding still very much a problem in those same areas, I do sense a potential momentum shift in the negative S&D price narrative that has plagued corn over the last 3 to 4 weeks. If we can assume the slowdown specifically in U.S. corn export demand and corn-ethanol use has now been digested, the USDA’s Weekly Crop Progress reports should start to take center stage. This supply-side storyline should prove much friendlier to Corn Bulls looking ahead into the last half of April and early May. 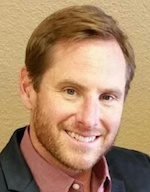 What’s the lasting takeaway from the April 2019 WASDE report? The one area where I will have to reassess my long-term thinking on corn is the potential upside for CU19 and CZ19 on rallies in May and early June. With 2019/20 U.S. corn carryin stocks now likely to exceed 2.0 billion bushels, until we know U.S. corn acreage doesn’t meet the USDA’s March forecast of 92.8 million (which we won’t until June 28th), the 2019/20 U.S. corn S&D is probably going to appear much more comfortable on paper in the May 2019 WASDE report (released on 5/10/2019). This especially holds true if the USDA maintains their 176 bpa “trend-line” yield forecast for their initial 2019/20 U.S. corn S&D balance sheet. It’s entirely possibly 2019/20 U.S. corn ending stocks will now project higher than 2.0 billion bushels in that May report as a result. However, as my S&D model shows above, if U.S. corn acreage falls just 1 million acres and the U.S. corn yield slips to 174 bpa, 2019/20 U.S. corn ending stocks could fairly easily move back under 1.80 to 1.75 billion bushels as the marketing year progresses. In my opinion those aren’t seismic changes requiring considerable “wishful thinking.” The USDA’s February Ag Outlook Forum 2019/20 U.S. corn export forecast will probably have to be lowered from 2.475 billion bushels; however other than that I see U.S. corn demand recovering slightly in 2019/20. Knowing this, what have been the May/June highs in September and December corn futures the last 3-years? The lowest “high” in September corn futures of $3.99 ¼ came in 2017 on June 8thand featured new-crop U.S. corn ending stocks projections of 2.110 billion bushels during the May and June WASDE reports. The corresponding December corn futures high in 2017 was $4.09, which also came on June 8th. The highest “high” in September corn futures of $4.44 came in 2016 on June 15th. The new-crop U.S. corn ending stocks projection in the May WASDE report that year was 2.008 billion versus 2.081 billion bushels in the June WASDE report. The corresponding December corn futures high was $4.49, which came 2-days later than the Sep high on June 17th. Right now I’m forecasting 2019/20 U.S. corn ending stocks in May of approximately 2.10 billion bushels. Therefore, this would say Sep corn futures ranging from $4.00 to $4.25 and December corn futures ranging from $4.10 to $4.35 remain in play on a June rally. Obviously this will require patience and some weather volatility this spring. Despite the lower weekly close, I would argue May corn futures weathered Tuesday’s “Bearish” April WASDE U.S. corn ending stocks increase of 200 million bushels fairly well. What’s next? A winter storm moved across large sections of the WCB Wednesday into Friday bringing with it more precipitation to areas already inundated with excess water/flooding. Furthermore NOAA’s 6 to 10-day and 8 to 14-day temperature outlooks continue to show below-normal temperatures for virtually the entire Midwest into April 26th. They also show above-normal precipitation. The 6-year average for U.S. corn planting progress is 43% for the week of 5/5 and 63% for the week of 5/12. Based on the current weather pattern and saturated soils it’s tough to imagine a scenario where we’ll hit those planting percentages this year. Obviously, we know the farmer can plant a lot of corn in a very short period of time; however as the clock ticks, questions will continue to arise as to whether or not this year’s planted corn acreage base will expand by the 3.66 million acres the USDA forecasted on March 29th. 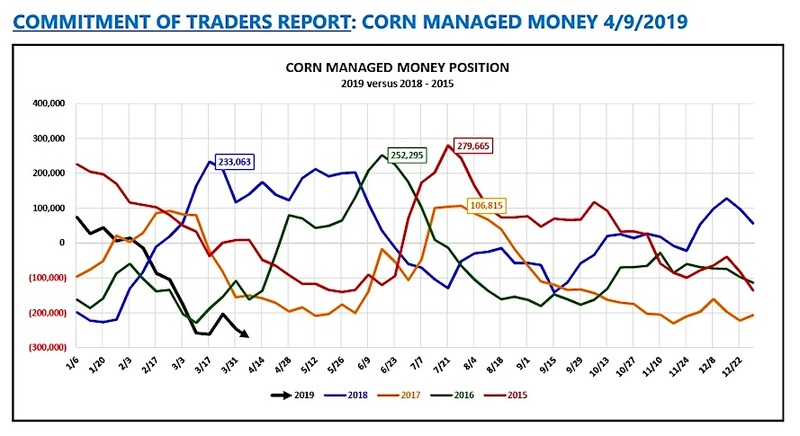 Friday’s Commitment of Traders report showed the Managed Money position in corn increasing to a new record short -271,746 contracts as of the market closes on 4/9/2019. Tuesday May corn futures made a new contract low of $3.55 ¼ as result. There are a lot notable grain analysts jumping on the Bearish bandwagon, leaning on a variety of U.S. and World S&D figures to defend their positions and the growing Managed Money short in corn. I’ve now seen new-crop 2019/20 U.S. corn ending stocks estimates above 2.3 to 2.4 billion bushels. To generate such projections they’re applying a record to near record U.S. corn yield on 92 plus million corn acres while also taking a sledge hammer to 2019/20 U.S. corn usage. And while I’ll admit the recovery in South American corn supplies could prove problematic to future U.S. corn exports, I’m not ready to hop on in on the same side of the canoe as the “experts” suggesting corn’s now headed 30 to 40-cents per bushel lower. The reality is we haven’t even planted an acre of corn in the states that determine the national corn yield. Not to mention U.S. corn demand isn’t stationary.